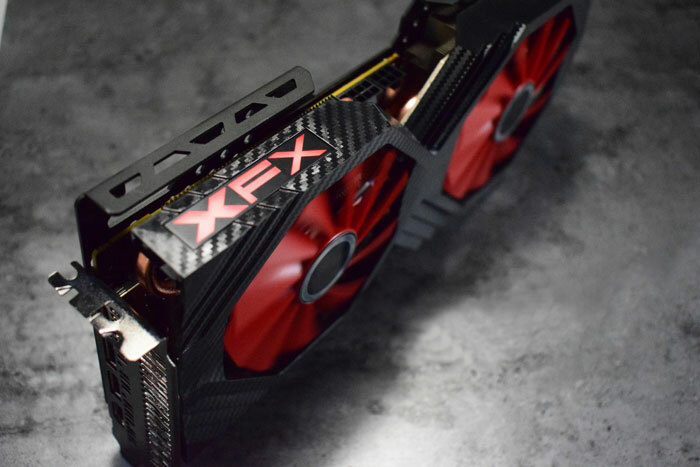 XFX has released some tasty and intriguing photographs of an upcoming Radeon RX Vega graphics card. VideoCardz, which sourced several photos, reckons that the pictures are of an AMD RX Vega 56 based card, due to the 8+6-pin connectors present. This certainly is an interesting graphics card design. 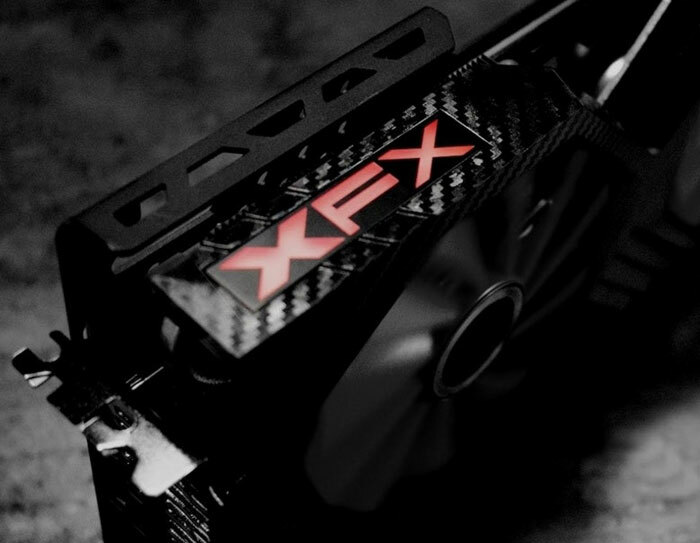 XFX has used carbon fibre and a pair of rather large looking fans to construct its custom cooling solution. Elsewhere in the photos, which cover several angles, you can see a full cover backplate, LED lighting behind the translucent XFX logo, and a notch atop of the card. Interestingly, that notch is where the power connectors reside in 8+6-pin config. This design was likely decided as that is also where the PCB ends, just over half way long the card’s length. Pondering over the rear view, showing the backplate, you can see that nearly all the card length following the Vega logo is an aluminium fin radiator assembly. 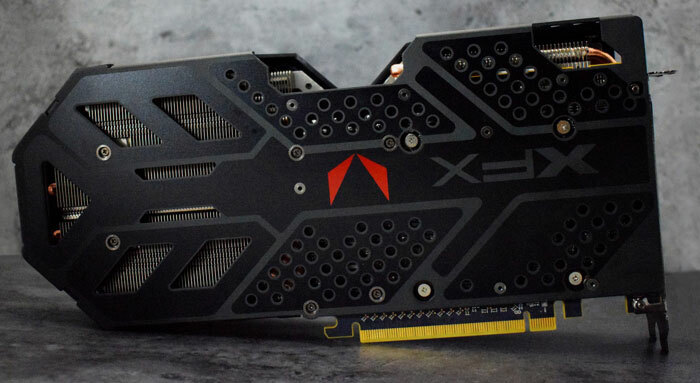 VideoCardz observes that the teased XFX Radeon RX Vega design lacks any DVI ports but you can see that there are three or four ports for HDMI / DP monitor connections present. These are all the details we have about this XFX card for now. For reference why not revisit the HEXUS review of the AMD Radeon RX Vega 64 and Radeon RX Vega 56? JayzTwoCents found quite a bit of difference iirc. It was able to maintain much higher boost speeds with a decent cooling system. Not in my experience. With my Vega64 fan set to max and +50% power limit, I couldn't sustain actual clocks above 1670MHz core/1070MHz HBM for TimeSpy graphics scores of around 7600, nor the hairdryer levels of noise. With more realistic fan speeds (but still noticeable), I had to keep it around 1600/1040 undervolted and a lower power level, and got TS graphics scores around 7200. I put a EK water block on it, and now it happily sits above 1730MHz/1095MHz and TS near 8200 with the same driver (17.8.2). These are to little too late, think about how long the GTX 1080 has been around with decent coolers, the only people that will be buying these are those with Freesync monitors, I've got Freesync but had my 1070 for over a year and really can't be bothered selling it off losing money to sidegrade just for Freesync, I'll wait for Volta/Vega now and then decide if I want to change back to AMD.